Neptune Chemical Pump Co. Inc.
Neptune Chemical Pump Co. is pleased to announce the addition of the Abaque Series Peristaltic (Hose) Pump product line to its portfolio for the Americas. All Abaque Series pumps sold in the Americas will now be manufactured and shipped from PSG’s Neptune facility in North Wales, PA. The move is being made to better align the Abaque line with other PSG products and services that address the same primary market segments. The Abaque pumps are still available in 9 different models/sizes—from the AB10 to the AB100—with flow rates ranging from .07 to 211 gpm (.015-48 m3/hr). The Abaque Series pumps feature a seal-free design that eliminates leaks and product contamination, which enables them to handle a wide array of challenging pumping applications in the oil and gas, chemical process, industrial and municipal water treatment, paint and coatings, and mining industries. The pumps, which can run in either forward or reverse, are self-priming and offer suction-lift capabilities to 29.5 feet, as well as the ability to run dry continuously without adversely affecting the pump’s performance. Ductile-iron and steel construction enables the pump to offer maximum discharge pressures as high as 217 psi. 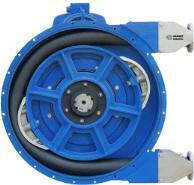 Abaque Series pumps can be ordered as bare-shaft pumps or with a variety of drive options. Standard drive configurations include C-face gear reducer or C-face gear reducer with TEFC, explosion-proof or single-phase motors.